As a leading distributor of products for self-sufficiency and energy conservation, Real Goods Trading Company wanted a showroom that embodied and reinforced their business ethic. Sited on a 12-acre parcel in Hopland, California, the Solar Living Center uses a wide array of energy efficient and climate responsive design features combined with careful site planning, sustainable materials and systems and native and edible landscaping. The new showroom has also improved their bottom line. In the first year of operation, sales were double that of the previous year and 50% over projections. Since then sales have continued to exceed projections. The American Institute of Architects honored this project by naming it one of the top ten environmental projects in the United States for Earth Day 1999. The building and landscape plan maximize elements of natural and designed beauty providing a sanctuary and testament to sustainable building practices, renewable energy systems and restoration of native ecosystems. Education is stressed throughout. The 5,500 sq. ft. showroom is built with 600 rice straw bales covered with “gun-earth” and a variety of other local, non-toxic, recycled and reclaimed materials. For example the curved glu-lam roof beams you see here are made from sustainably harvested douglas fir, which was cut, milled and manufactured within 40 miles of the site. The showroom’s gracefully curved and stepped roof, along with clerestory windows and a series of light shelves, deliver natural light deep into the interior without glare or overheating. Artificial light is rarely used. When it is needed, it is supplied by the center’s on-site grid-intertied energy production system which generates ten kilowatts of photovoltaic power and three kilowatts of wind power a day - enough to power the site and have extra to give to the local energy company. Sited on a parcel which was once a dumping ground for highway rubble, the Solar Living Center now thrives as a living example of sustainable design. Lush native and edible landscaping, a variety of place-specific and climate responsive site features, a “green” children’s playground and an exhibit-filled retail showroom which utilizes a wide array of energy efficient design features and sustainable systems, demonstrate the best practices of sustainable design and provide a wide ranging educational experience for customers, visitors and employees. This helps fulfill the company’s mission while simultaneously improving their bottom line. The building is designed to work with the changing sun angles throughout the day and seasons. In the hot summer months, overhangs, a vine covered recycled redwood trellis and adjustable hemp awnings control excess solar gain, while light shelves deliver natural light deep into the interior without glare and overheating. Operable windows promote natural ventilation. In the winter months, when the sun is lower in the sky, the curved facade and large windows allow the sun’s rays to penetrate deeply into the building providing warmth and light throughout the day. According to the client, the building “is so adept in its capture of the varying hourly and seasonal angles of the sun that additional heat and light are nearly unnecessary.” In fact, this building has no mechanical heating or cooling system, yet maintains an interior temperature in the 70’s throughout the year. 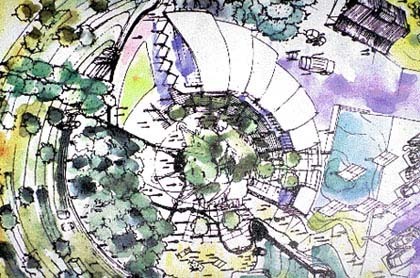 The building is curved in both plan and section embracing the “Solar Oasis” - a central plaza with a fountain, solar calendar and circular trellis of poplar and aspen trees. Besides being a relaxing and beautiful place for gathering, play and celebration, the oasis is positioned so that the fountain and vegetation can cool the 100ºF plus summer breezes which blow from the South before they reach the building. A solar powered pump moves one million gallons of recycled water throughout the site for irrigation, evaporative cooling, sound and visual delight. The journey begins as the water spills over the sides of this recycled redwood wine vat and travels through the water-purifying flow form fountain. It continues along a creek, passing through the children’s play area and the central fountain of the “Solar Oasis,” before flowing into the constructed wetlands and pond system which cleans the water and provides a healthy habitat for native plants and animals. Native and drought tolerant plantings produce an abundance of edible and otherwise useful crops, attract pollinating insects, birds, and animals, and provide a beautiful, relaxing and educational environment for visitors.